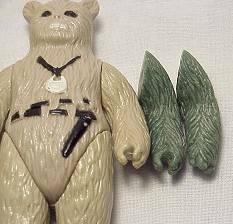 Of course, dismembered Ewoks are a part of every Star Wars fan's ideal world. This is especially the case when it comes to hardcopy body parts, which actually seem to turn up more frequently then pieces of other types of figures. Above are pictured a pair of hardcopy legs to the character Logray. 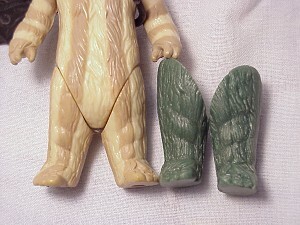 As you can see from a comparison of the hardcopy legs with those of the production figure pictured beside it, the prototypes echo the design of the final toy exactly, right down to the last detail. The situation is somewhat different in the case of these hardcopy arms belonging to the Chief Chirpa figure. Even though both prototype limbs represent the figure's left arm, they are substantially different, indicating in their disparity a significant alteration during the production process of the figure. As you can see, one arm features a firmly closed hand, while the other (the version eventually used on the production figure) shows the hand open and capable of holding a weapon. While, in many ways, hardcopy body parts are of interest simply by virtue of what they are, it is the differences that surface in some of these pieces vis-a-vis the production versions that make them really interesting.